Industry-leading research and development, combined with extensive testing ensures that our ESPRESSO HYGIENE KIT can be used across a whole spectrum of machines. These KITS contain ESPRESSO POWDER, ESPRESSO BRUSH and user instructions to provide a user friendly solution to eliminate the risk of machine breakdown and to ensure a hygienic machine whilst maintaining dispensed product quality. EASE OF USE — Contains all the powder and brushes necessary to carry out regular cleaning and hygiene of group heads for 2-3 months. 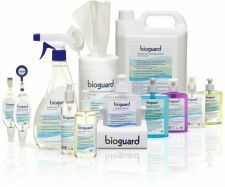 The use of these KITS makes it easy to identify machines which are not being regularly cleaned. HIGH FOAMING ACTION — A high foaming action ESPRESSO POWDER ensures that our product penetrates all component parts and pipes during the back flush cleaning cycles guaranteeing that your machine is properly cleaned, reducing the likelihood of machine breakdown and ensuring consistent product quality. SAFE TO USE — Product in kit is safe to use and does not contain harmful ingredients that will damage and corrode machine components. Use daily on machine group heads in accordance with machine manufacturers instructions. Use 4 scoops into group heads and follow machine manufacturers cleaning instructions.